Backyard - Beautiful patio with picnic table, BBQ grill and a secluded hot tub for your enjoyment. 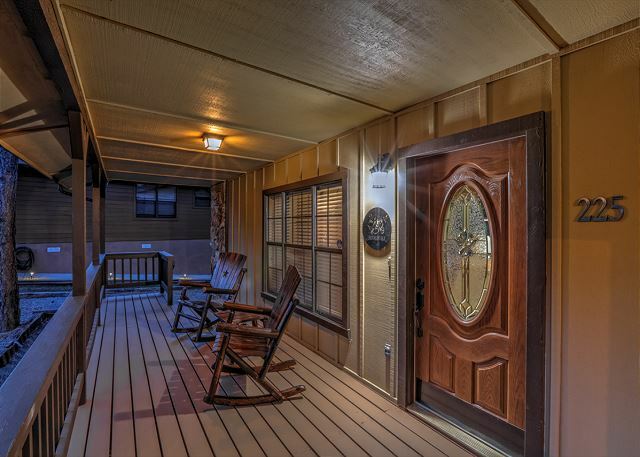 Front Porch - Enjoy the mountain air in these rocking chairs or the porch swing on the end of the porch. 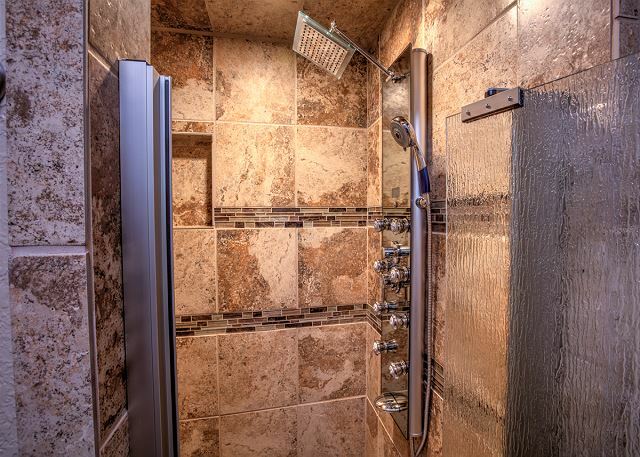 Master Bathroom - Luxurious walk-in shower with 8 massage heads, shower wand and a rain shower head! 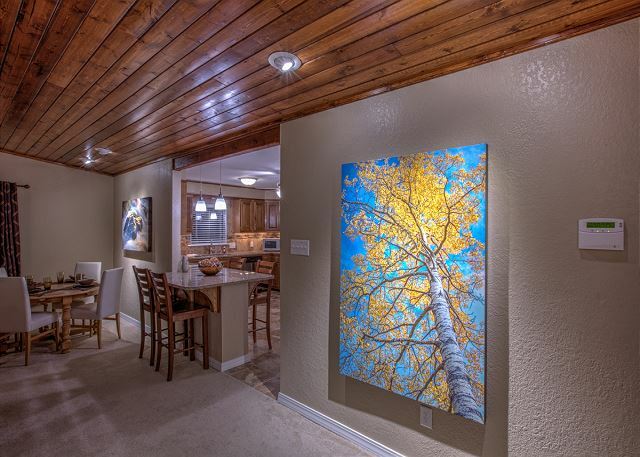 Offering upscale living, Sierra Midtown is a lovely 3 bedroom, 2 bath house centrally located just off of Sudderth and offers easy access to all the great things in midtown Ruidoso. 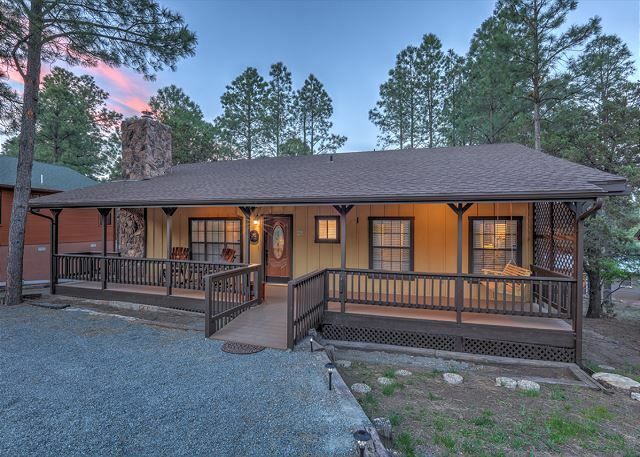 Enjoy a cup of coffee on the front porch rocking chair while watching the wildlife that frequents the property or just lounge on the porch swing for a while. 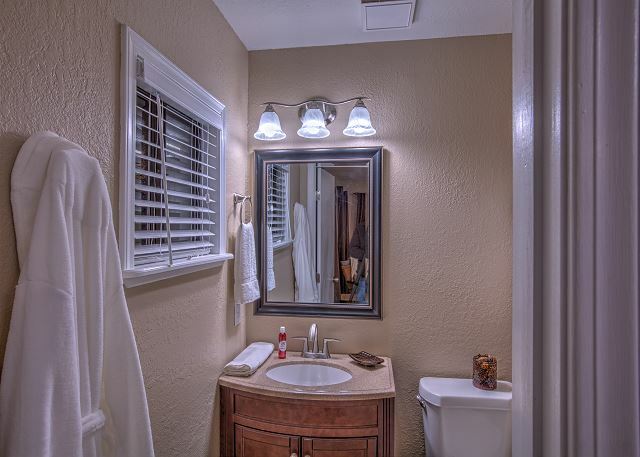 Enjoy the large, fenced back yard and patio area complete with gas BBQ grill and private hot tub. Grindstone Lake and Stables are just a short distance away or you can walk to parks or downtown shopping and restaurants. 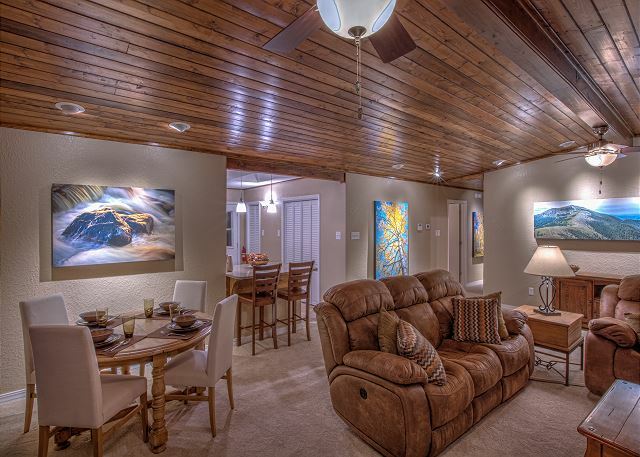 This home is beautifully decorated and has a fully appointed kitchen. 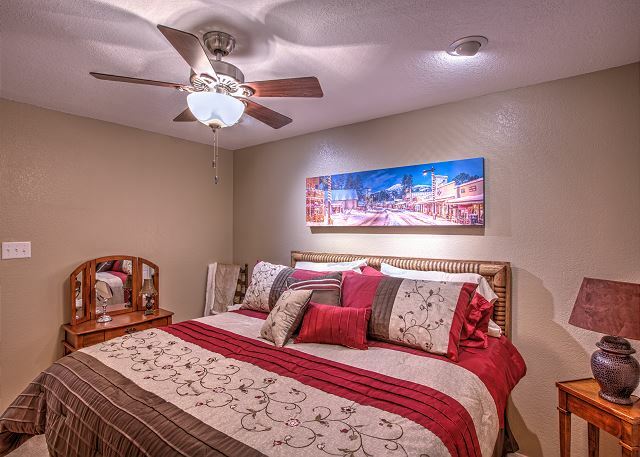 This beautiful home will sleep 6 people comfortably in beds with the option of adding an additional king or queen blowup mattress for a small up charge for extra guests. 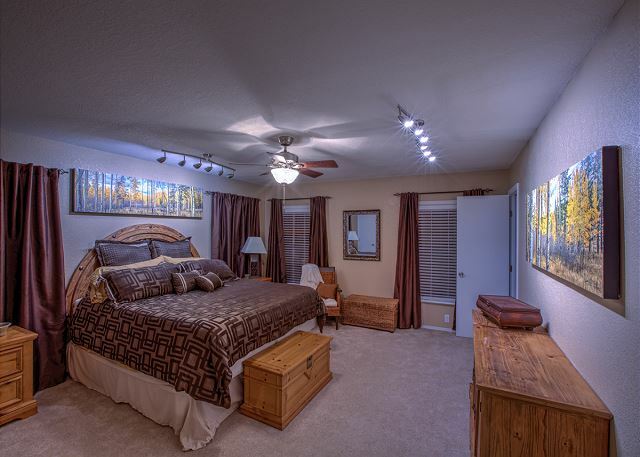 The bedrooms feature 3 king beds and all have extremely comfortable memory foam mattresses & 1800 thread count sheets! Great for couples traveling together or perfect for families. 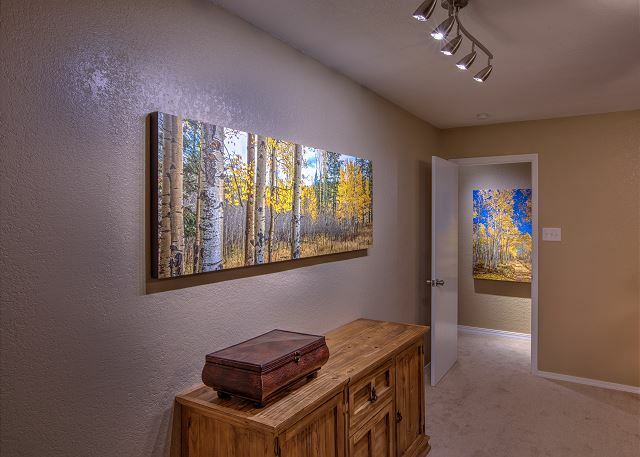 This home was done very nicely, from the cleanliness to the decor. The area is beautiful and the location was central to everything we wanted to see. We wish that we could have stayed longer, but will definitely go back. The beds were very comfortable, just really high. It was so nice to sit on the front porch and enjoy the cool morning air. We did not use the hot tub, but the setup and privacy for it was very nice. Absolutely wonderful!!! Loved the fruit and cheese tray and fruit water upon arrival. Smelled wonderful, very clean , and loved location! We had problems with cooling system and they went above and beyond and got it fixed ASAP!!! Great experience, we will rent again!! The cabin was great. Decorated very well and clean. Close to downtown. All in all the property was great. The instructions were spot on and we had no trouble when arriving. The House was clean and neat and smelled wonderful. I will certainly use this property again and will recommend it to friends and family. We have stay 2 consecutive years in this property. The cabin is very pretty. It has all the amenities. Huge living room, spacious kitchen, beautiful bedroom, great backyard that has a bbq grill and a whirlpool. It is 1 block away from the downtown area. You can see deers in the morning and even feed them. The deers are somewhat domesticated and will eat from your hand. Looking forward to staying at this cabin again in 2019! It was such a pleasure to arrive to such a clean and very organized rental. A pitcher of flavored water and fruit & cheese tray was a delight. It felt as if I was staying at a hotel but with the luxury of a home. The bedrooms were nicely prepped and the bathrooms were very clean. The one time I requested service I received a response very quickly and was a city issue not theirs. I will definitely be staying at these rentals again. It made our vacation so much more satisfying. 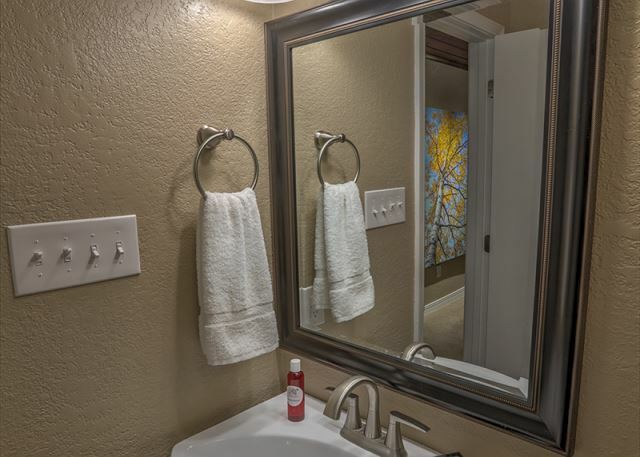 Sierra Midtown is a very nice place to stay, convenient location. This was an awesome experience. Great family time and very comfortable. This has been the perfect family vacation for two trips now. We were so pleased with the experience that we booked it again 6 months later. There is plenty of room for 3 generations to stay in one cabin, we love it there. We had the best time, in this most wonderful house! We could not have asked for more! All things we needed, PLUS extra comforts were provided. Plush robes, hot tub, Kuerig coffee maker, we even baked cookies! Just lovely! We enjoyed the stay in Ruidoso. We thought the customer service and the quality of the home was excellent. We had a great stay, everything was just as described. Loved the fruit and cheese tray and the water was much appreciated when we arrived. 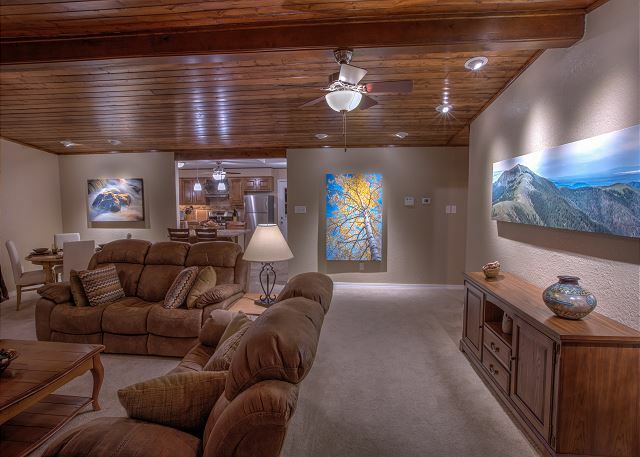 The property was well appointed and maintained. Instructions for use of appliances and amenities were clear and easy to follow. If in Ruidoso again, we will definitely book again. The property was more than expected. Very clean and well stocked with all the comfort if was in a great city location. Neighbors dogs were kind of yappy.. Only had deer one day. Loved watching the sun rise from the hot tub. Gods beauty. Overall It was wonderful, comfortable and the business end was perfect. I shall return and tell all my friends about this property. Thanks from the bottom of my heart. Loved it. The space was great, the amnesties were amazing. Close to everything. The deer came right up to the front door and my Daughter and son in law even pet them. 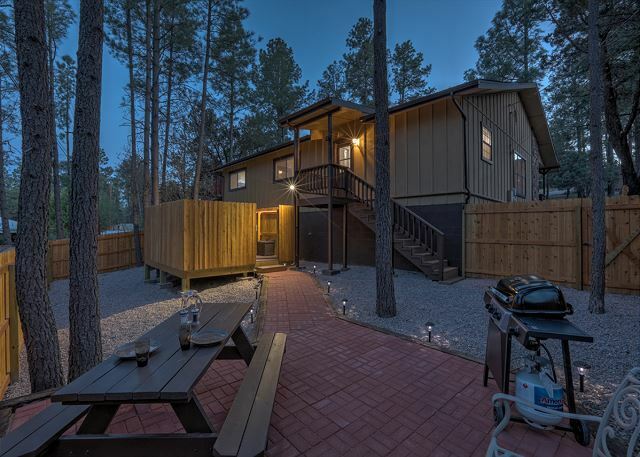 We couldn't have asked for a better place to spend our time in Ruidoso. We stayed in another one of your rentals last year and loved it as well that is why we chose you again. Our trip was absolutely amazing! We arrived to find a wonderful snack and water for us and things just got better from there. The beds and sheets were heavenly, the front porch and back patio were perfect for just sitting and enjoying coffee and conversations, we loved getting in the hot tub, and finally the location was perfect. We were able to get around town quickly and easily from the house. Great place. Very well kept. Nice hot tub. Neighbor was noisy. Couldn't get cable to work. The cabin was meticulously clean and very comfortable. My family and I enjoyed our stay there so much that we 're planning to return as soon as possible. We felt very welcome when we got to the house. It was very clean inside & out. Everything we could ask for. The location was great,too. Close to downtown shopping area which is what we wanted. We will definitely stay there again. It does our heart good to know that you were happy with your stay and that you felt welcomed when you arrived. Our goal is to embrace our guests with a "Ruidoso welcome and a smile" while providing a beautiful home to escape the crazy world. We look forward to seeing you again in the future!!! We felt welcomed from the minute we walked in. The little touches that were left made all the differences. Not to mention the fact that the cabin itself is so beautiful! We enjoyed the hot tub and the proximity to downtown. Overall it was an excellent place to stay! Thank you for the wonderful review! Making our guests feel welcome and special is what makes us happy to do what we do! We sometimes wish we could see our guests faces when they first walk into the cabins for the first time. 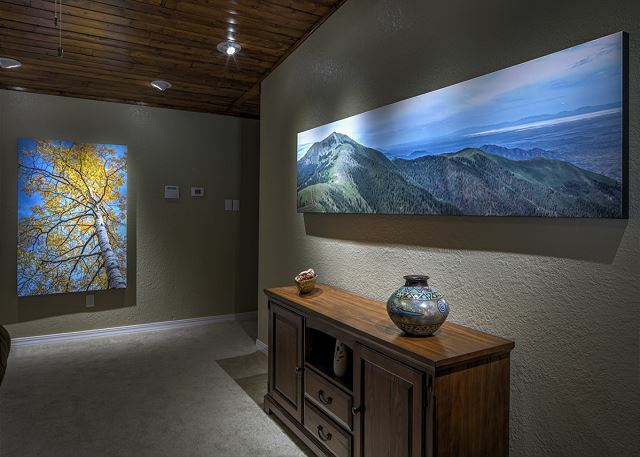 The little touches are our way of saying "Welcome to Ruidoso.... we are glad you are here!" We are certainly glad you chose 2 Ruidoso Redheads and hope you come back soon! Excellent place to stay. Great location. The website pictures are exactly as the house is. Very, very clean and well kept property. Thank you so much for the awesome review! 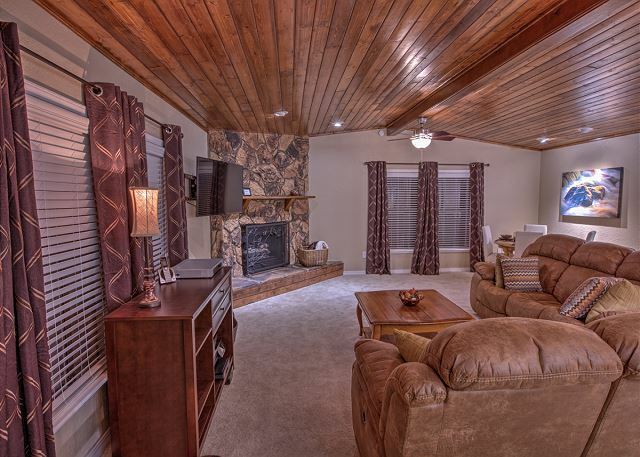 We are so glad you enjoyed your stay with us and hope to see you back in beautiful Ruidoso soon! We just got home from our trip and it was amazing! The house was beautiful and fit our needs perfectly! It was easy to find and close to the shops and restaurants in town. When we arrived they had a plate of welcome treats for us! Trina was so helpful! She found us a baby sitter and gave us great recommendations for places to eat. The house was clean and full of almost everything you could need for your stay! 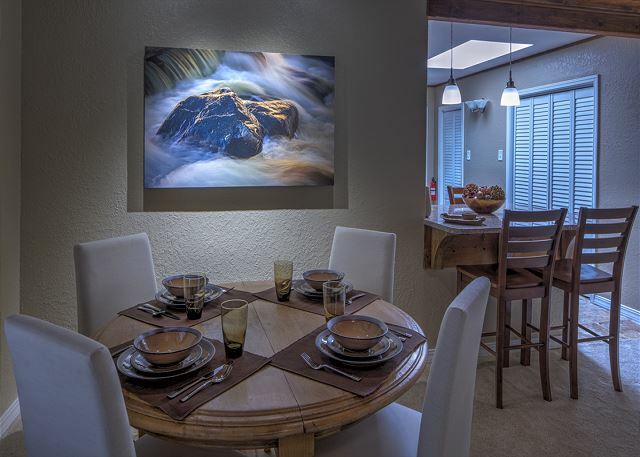 Our goal is to provide relaxing and carefree experiences for our guests while they are here in beautiful Ruidoso! It looks as if we hit the mark with you and your family and I am so glad. Trina was thrilled to be able to help your family with finding babysitting accommodations & restaurant recommendations! We certainly hope that you choose to stay with 2 Ruidoso Redheads again in the future! We look forward to seeing you again soon. House was perfect. Arrived Friday and Saturday morning woke up to 4 - 5 inches of snow, just beautiful. They came out first thing and shoveled our drive, so nice! Thoroughly enjoyed our stay! We are so glad you enjoyed your relaxing getaway! We ordered the snow especially for you! LOL Just kidding! We are glad that it worked out to be a perfect retreat for you and hope to see you again soon! We are so glad you enjoyed your stay with us! We hope to have you visit again soon! Thank you for staying with 2 Ruidoso Redheads! We look forward to serving you again in the future! We decided on short notice to go to Ruidoso with our son and his family for a long weekend. We really enjoyed our stay at Sierra Midtown. 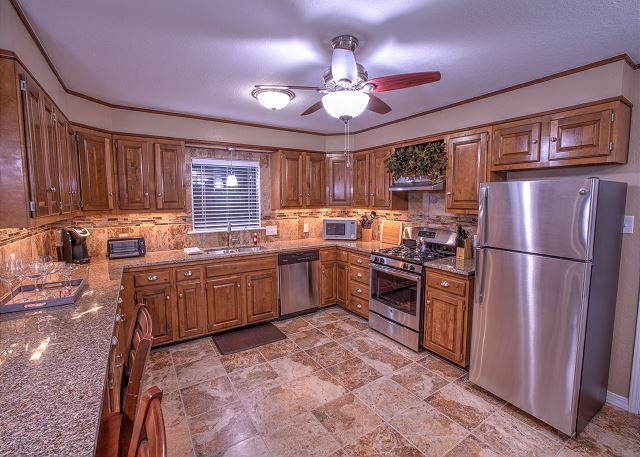 The large, fully equipped kitchen was beautiful and had everything you would need to prepare complete meals. We loved the cheese and cracker plate, fruit plate, and chocolate covered strawberries left for us in the fridge! 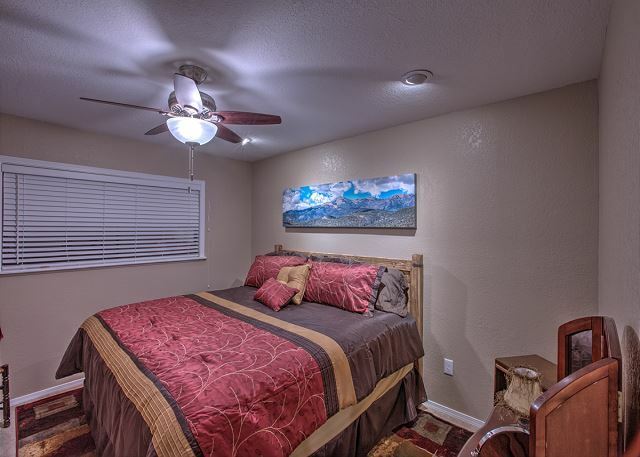 The owners have really have done a great job, and spared no expense in furnishing and decorating, from the large, comfortable living room, to the comfortable beds and large closets in all 3 bedrooms. We enjoyed watching the deer and hummingbirds from the big front porch and it was conveniently located near the middle of town. Since we had 2 little ones with us, we didn't use the hot tub, but it would be very relaxing to cook out on the grill and enjoy the hot tub. Thank you for a nice, comfortable, relaxing place to spend a weekend! We are so glad you enjoyed your time with us and that we provided a relaxing retreat for you and your family! We appreciate your kind words and hope you come back to stay with us again soon.